Gov. Doug Ducey is a stooge of the Koch Brothers, who fund him with dark money and instruct him on their anti-education agenda. In a stunning new poll of Arizona voters, 59 percent of Republicans, Independents and Democrats combined said that they want someone else to lead the state besides incumbent Doug Ducey. Only 26 percent of voters said Ducey should serve another term and 15 percent said they were unsure in the new June 26, 2018, NBC-Marist poll. Confirming how fed up Arizonans are with Gov. 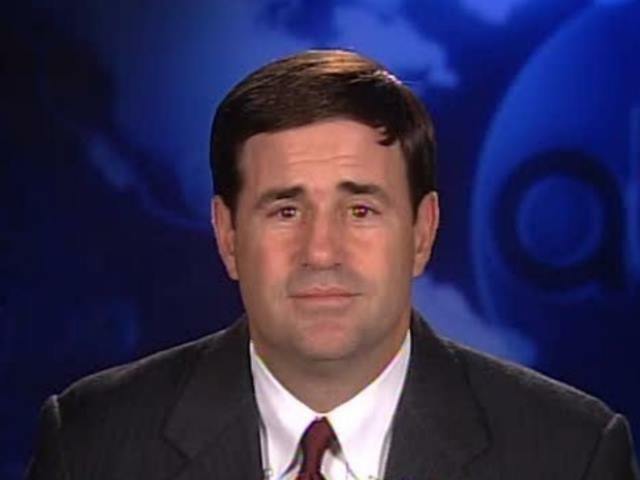 Ducey, a June 25 Emerson College ePoll reports that Ducey has a lower approval rating (31%) than President Trump (43%) in Arizona and that a majority of voters (64%) think education funding is not enough. Under Ducey, Arizona ranks 48th for public school funding and dead last in the nation for teacher pay. Arizona has cut more from education funding than any other state in the nation, a decline of more than 35%. Gov. Ducey has devastated public schools, community colleges, and state universities. There are 2,000 teacher positions that are vacant or occupied by someone unqualified. He fought the RedforEd movement but finally caved in. Even so, he left public schools with $700 million less in funding than a decade ago. Under Ducey, Pima and Maricopa Community Colleges get zero funding from the state. He has specifically targeted Tucson with higher property taxes, by withdrawing state funds to pay for school desegregation efforts, and shut down Tucson’s program to destroy guns used in crimes. 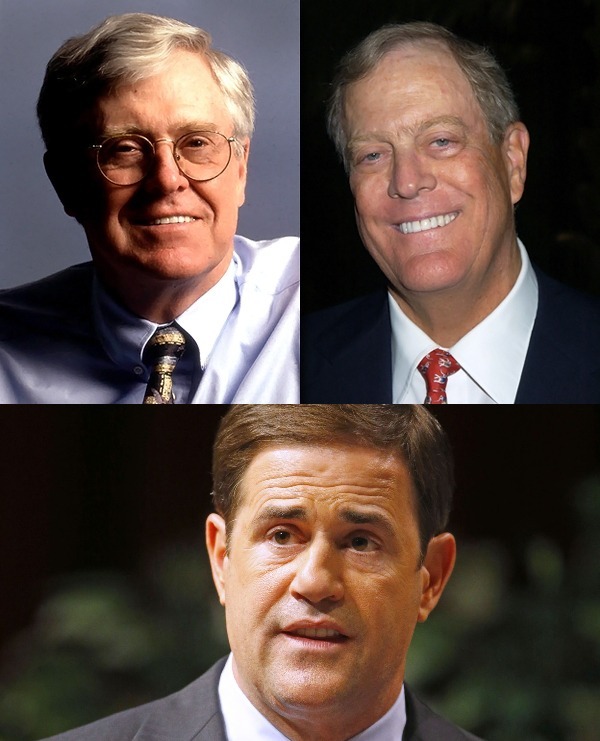 Arizona is “ground zero” for Koch brothers attack on public education. Ducey regularly attends secret meetings of the Koch brothers where they give him instructions to carry out their anti-public school agenda, and fund him with millions in dark money. In response, voters are collecting signatures to place the Outlaw Dirty Money public initiative on the ballot in November. As a part of the Koch Brothers agenda, Ducey signed a law to increase school vouchers to private and religious schools. A grassroots group of parents and public-education advocates called Save Our Schools Arizona collected enough signatures to stop the expansion and put it on the November 2018 ballot in Prop. 305. While gutting funding for education, Ducey earmarked $2 million toward the notorious “freedom schools,” programs at Arizona State University and the University of Arizona focused on anti-consumer philosophies and backed by the Charles Koch Foundation. The universities didn’t want additional funding for the freedom schools. Read: Professors Lay Bare Koch Scheme to Corrupt Arizona Universities. Next articleThis Happened Because We Didn’t Vote! Don’t bank the win in the governor’s race just yet. Will the Republicans who would prefer someone else in office really vote for a Democrat? Or will they hold their nose and votn’t have a strong opinion of Ducey one way or the other. They are not counted in his approval rating. Don’t make the Hillary blunder of thinking this is a slam dunk, because it is very far from that and it will take organization, effective messaging, and, of course, lots of moneye for Ducey because he’s better than a Democrat. Then there are those voters who don’t have a strong opinion of Ducey one way or the other. They are not counted in his approval rating. Don’t make the Hillary blunder of thinking this is a slam dunk, because it is very far from that and it will take organization, effective messaging, and, of course, lots of money.